A group of young hockey players from Detroit began Thursday night giving back to fellow children in need alongside Detroit Red Wings players and their significant others. What they weren’t aware of is the joyous surprise that followed. 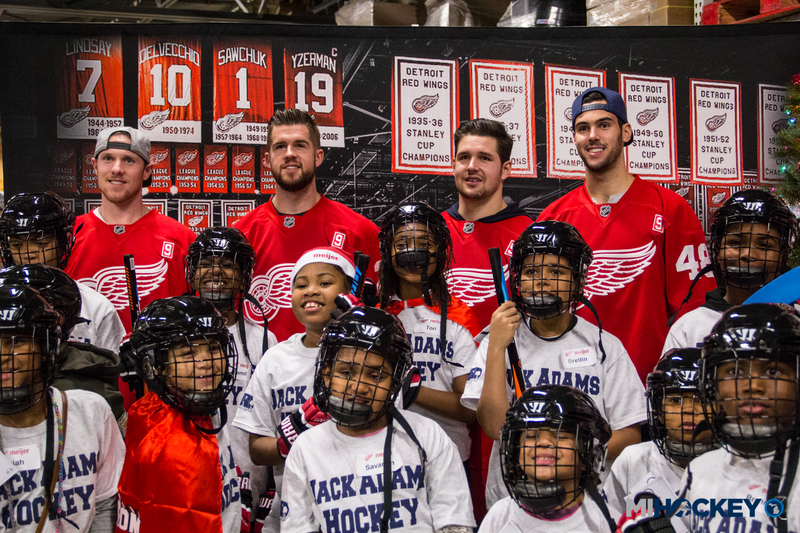 Twenty kids from the Introduction to Hockey program at Jack Adams Memorial Arena in Detroit were treated to a pizza party at Meijer in Madison Heights and then went on a shopping spree with Detroit Red Wings players – Jimmy Howard, Mike Green, Xavier Ouellet and Ryan Sproul – and the Lady Wings. But the purpose was not to find gifts for themselves, but to give back to patients less fortunate at the Children’s Hospital of Michigan. “Before the surprise, a lot of the kids were really excited to give back to the community, to give back to those in need, so that was really what mattered,” Jack Adams coach Dave Pitts said. Ouellet said it was great to see the kids’ enthusiasm for generosity. Being the holiday season, that’s really what it’s all about, too. Once the kids were done checking out, Wings defenseman Mike Green announced that they would then be receiving the chance to do it all over again, but this time, they were able to pick out gifts for themselves. And the surprises didn’t end there; once the kids were done shopping, they learned the Wings had provided them with brand-new Warrior hockey equipment. For players who were once in the kids’ shoes – or skates, if you will – it was an especially neat surprise to give. On Wednesday, Dec. 14, the Wings will deliver the purchased toys to the Children’s Hospital of Michigan as part of their annual holiday visit.